Turns out I needed more than a couple of weeks. And I’m not promising to keep you posted (pun intended) every day, but just know that things are progressing happily and I’m ever so busy learning about myself. 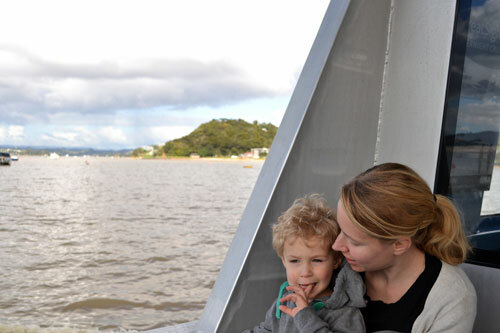 Having kids and renovating (especially at the same time) teaches you a lot – like “just stop and listen for a while”! After some sea air, reading this book, and working on some projects without taking photos for the blog (so liberating, although I may regret later!) I am back to blog land with a more realistic view. It looks good! 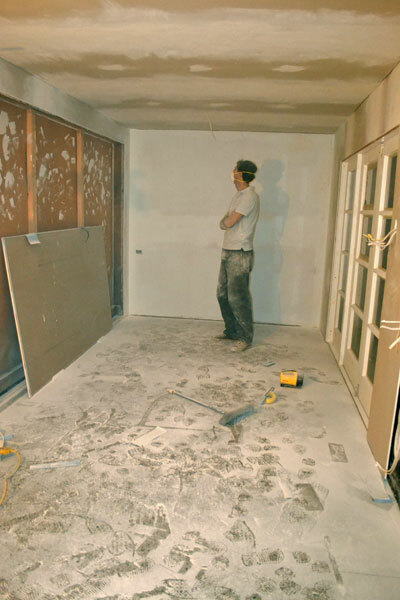 This entry was posted in DIY, Family, Our Renovation and tagged break from blogging, highly sensitive child, renovating on September 24, 2012 by Jolene. The latest plastering and sanding job has gone relatively smoothly (excuse the pun), not least because I wasn’t involved this time! 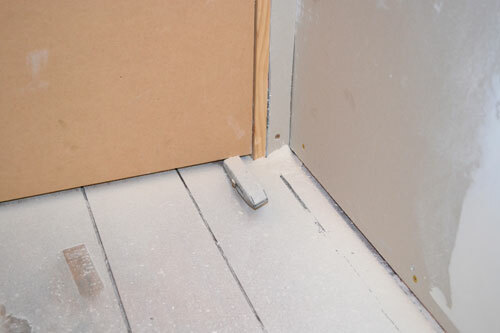 But even Mr commented that it didn’t seem so bad this time as last time and I am very impressed at how little dust has found it’s way beyond the four walls of the new bedroom despite not sealing off the doorway or anything. 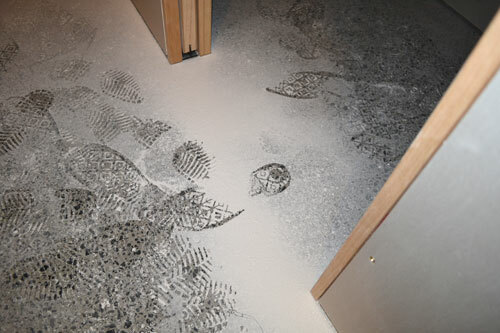 It seems plaster dust is quite heavy and clingy and not liable to blow through the millimetres under the door. We can be very thankful for that. 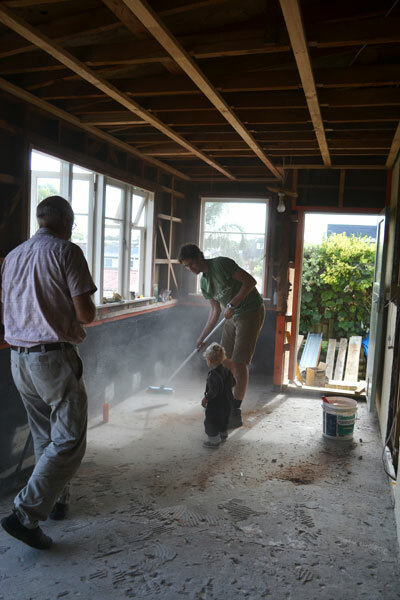 It’s also not caused too many tantrums from the little one not being allowed into the “noo bedroom” – he certainly knows what dust is and has accepted the “too dusty” reason. You can see above how we’ve boxed in around the hot water cylinder. I’m the first to admit it’s not an ideal addition to the corner of the room and it certainly encroaches on the window, but we had no option besides going down the expensive route of getting consent to shift the cylinder. I think once we add some storage shelves to the right and a nice, tidy window treatment it will look a little more like making sense. This is the internal door wedged shut with a stanley knife of all things. 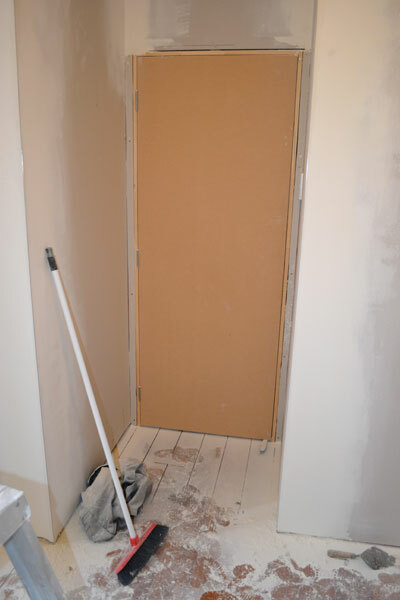 At this stage the original exterior door is still in place as it is very useful for all the ins and outs of plaster dust covered people and tools. Once we’re done cleaning up in here it’ll be replaced with the spare sidelight from the french doors and access will only be via the internal door off the hallway. Needless to say my first attempt at cleanup didn’t seem to make a dent in the dust despite collecting half a bucket of the stuff. I might have another go at it tonight and then snap an “after” shot or two. So the goal of end of November is well out… by Christmas – probably not happening either… post Christmas and holiday but before baby – fingers crossed! 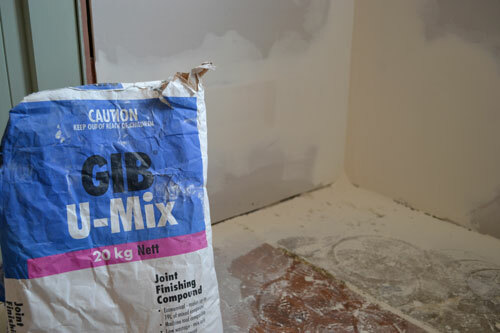 This entry was posted in Children's Bedroom, DIY, Our Renovation and tagged bedroom, dust, plaster, renovating, sanding on December 1, 2011 by Jolene. 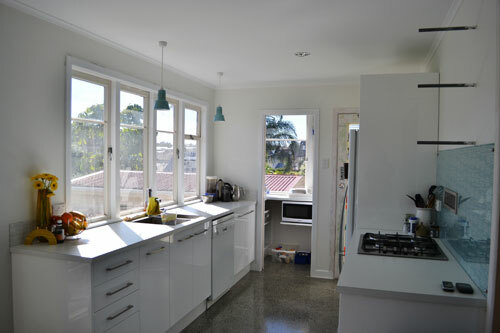 New kitchen photos – whoop whoop! But just because there’s a little bit of power-crazy nastiness in me a call for suspense here, I’ll give you this first. 6 months ago we had a kitchen in the middle of the house (well we still do…), with an internal window looking through the sunroom, and a laundry off to the side with another window looking at our fence. 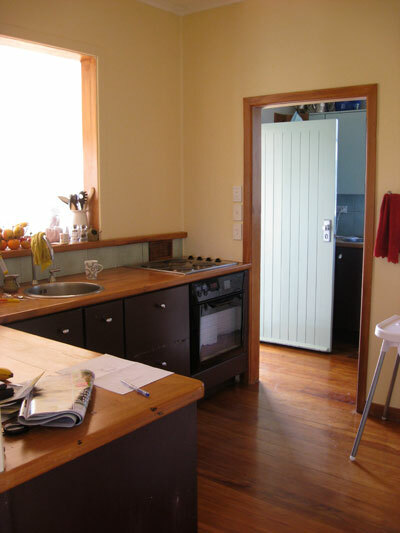 All in all, a little gloomy and average, with perfectly adequate but tired cabinetry and an also perfectly adequate but not my style wooden benchtop. According to the master plan (another post perhaps??) it has to go to make way for another bedroom. But first, a new kitchen… in a space that just housed our desk but was begging to be transformed into my happy place (and why not the kitchen seeing as I do actually spend a fair bit of time in there for one reason or another?!). 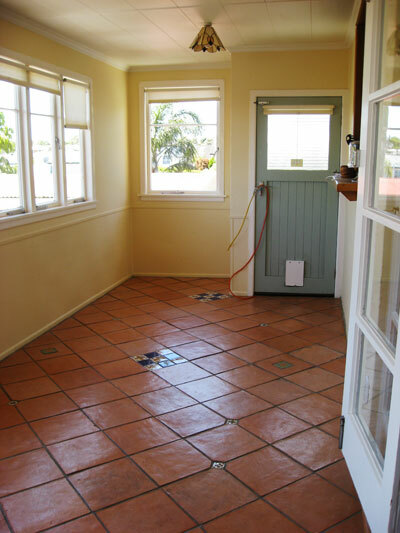 What was originally the verandah of our house was walled and roofed in some time ago to create a space that got the best sun in the house but made little sense in function or flow. And finally… it looks a little different again! Above the splashback there you’ll notice some steel pipes sticking out of the wall – they are not towel rails (temporarily they are!) 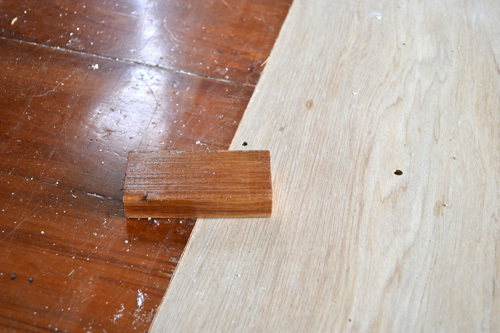 but brackets for open shelving which we’re working on (or I’m constantly reminding about and he’s working on!). 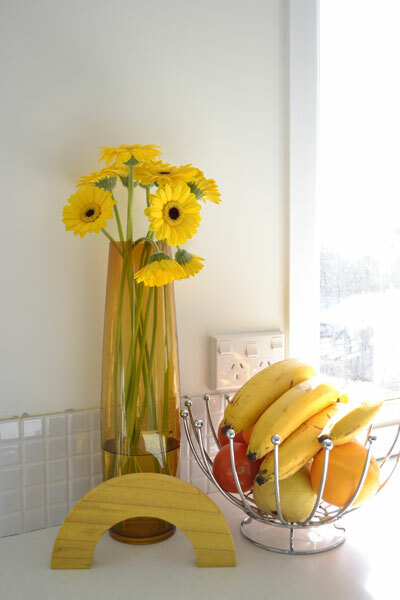 My mother in law gave me some flowers last weekend and they have pride of place in my new kitchen! Oh happy, happy kitchen! 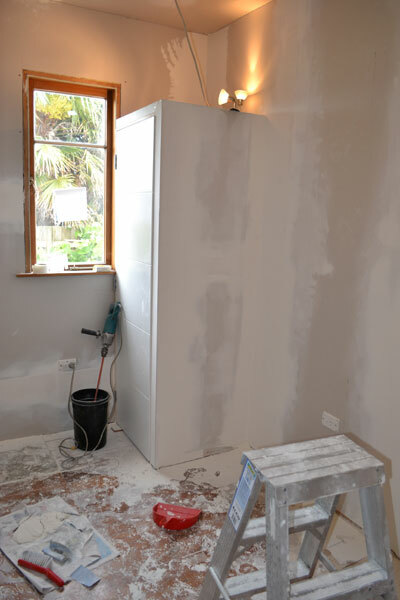 This entry was posted in DIY, Interiors, Kitchen, Lighting, Our Renovation and tagged benchtop, demolition, diy, kitchen, renovating, terracotta, tiles, welcome on August 8, 2011 by Jolene. The final transition from old to renovated (I won’t say new as it’s not an add-on) is in a step from lounge to dining. 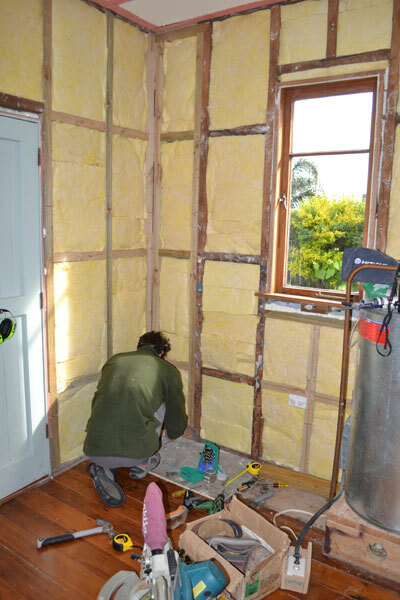 We actually stuffed some insulation down in the gap between floors (see the first photo), just because we had some handy, and, umm it makes the step feel warmer already – really! Nice! Obviously we have yet to stain the step and paint the rest of it (forget what those particular bits are called… I know they’re not architraves or skirtings), but the good news is deep in the garage a little pot of “previous owners stain” was unearthed (I don’t use that word lightheartedly…) and the sample proves we have a match! It will take some time to match the dents and scratches from old to new, but with the little one’s fondness for ladles, tongs, hammers and drills, combined with the incessant desire to bang them on all surfaces perhaps it won’t take so long if only I can confine him to the new step… any ideas aside from sandwiching him between yet more temporary walls either side of the step?! 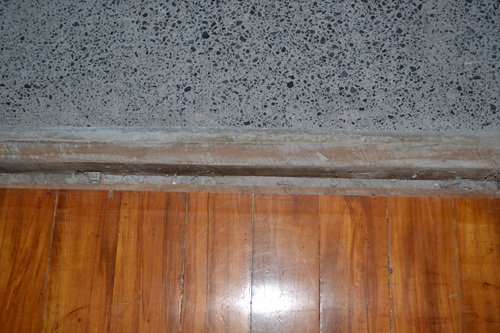 This entry was posted in Interiors, Our Renovation and tagged concrete, floor, renovating, wood on July 14, 2011 by Jolene. We now know why everyone said “oh gib stopping is such a terrible job… get someone else to do it”. But with such a small area to do it didn’t seem worth paying a whole lot of minimum charge to someone else. In hindsight, maybe it would have been worth it (that’s if they clean up the mess afterwards too?). One less than perfect job later though and we can say it’s done! And another skill up the man’s sleeve. 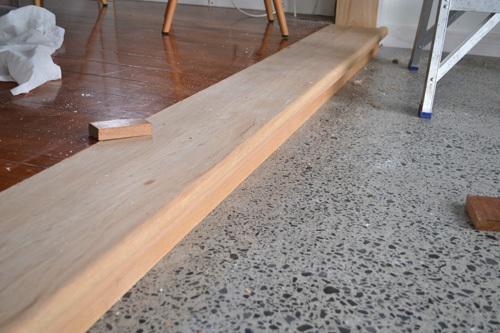 This entry was posted in DIY, Interiors, Our Renovation and tagged diy, dust, gib, renovating, sanding on June 13, 2011 by Jolene. Some time ago I sat down with the colour swatches and picked out some whites. It’s a wee bit insane how many options there actually are for white… even more so when you pick out some “different” ones, only to paint them out and see that really, there’s not all that much difference. A little bit disheartening, especially when I assumed this would be one of the most fulfilling decisions for me (really?!) in the whole renovation process. Why are we being boring and sticking to white you might be thinking? Because the lightness of the afternoon sun streaming into the lounge and “glowing” off the walls was one of the things that really struck me when we first came through at the open home. (Did that sound a bit convincing?) While the exact tone of current white is a little too green (especially at night) for me, I do want to stick with the white to keep that “goodness and light” feeling. Secondly, I tend to change my mind (we’ve been here a year and things in my mind have started to take on a whole new look than they did at the first draft…) so a blank canvas is not a bad thing. I just prefer to change out the accessories and artwork on a whim than bother with a repaint. On the other half of the same board is a full rice cake, which is just a bit too strong and would likely go a bit dark when natural light is low (grey days like today) or non-existent (evenings). So Half it is (now I can’t say I don’t do things by halves…). 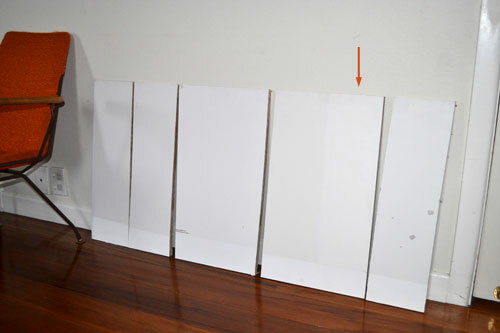 By the way, I found it useful to paint on boards so I could move them around the room and see how the colour looked in different lights. Clever huh?! 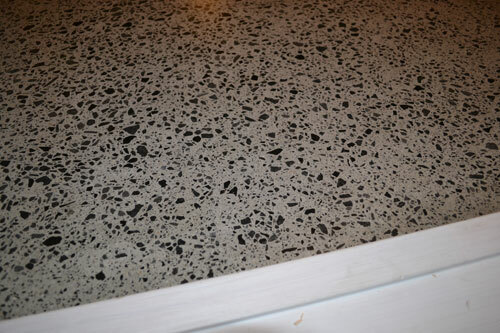 This entry was posted in DIY, Interiors, Our Renovation and tagged paint, renovating, resene, swatches, white on June 4, 2011 by Jolene. 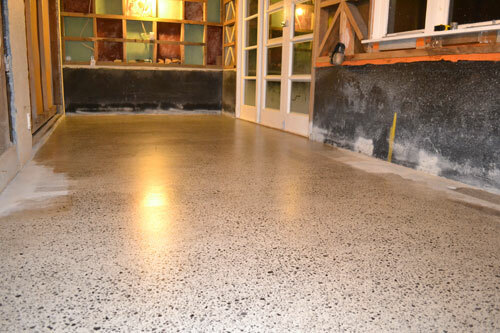 For those of you who can’t wait to see the concrete floor, you will have to suffice with a few 95% complete shots as it will be a wee bit longer before the floor is actually 100% done (and we celebrate by getting outta the house for the weekend!). 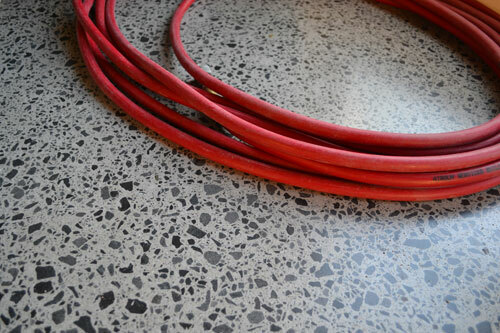 Once we have the finished floor in a photogenic state I’ll do a complete start to finish post – isn’t that something to look forward to?! The good news is we sped up the end process by going for the sealing option rather than the polishing (a bit of history on that here) – it was just all glum faces around here at the thought of endless nights of polishing with a little-wee-tiny grinder down on hands and knees. 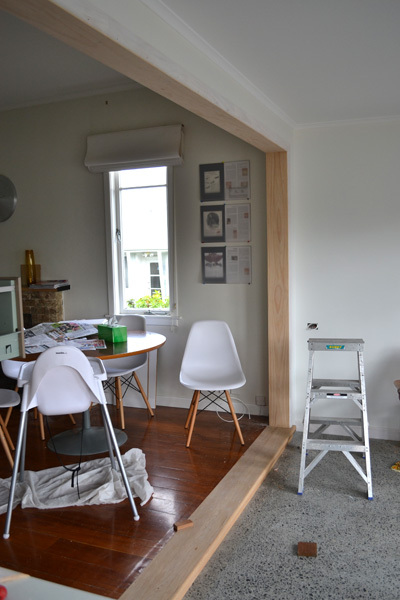 At first I was not keen to give up because I wanted the gorgeous gloss of a polished look, but in hindsight the semi-gloss seal suits our house better as it won’t look so glaringly new next to the “a bit beaten up” floorboards. 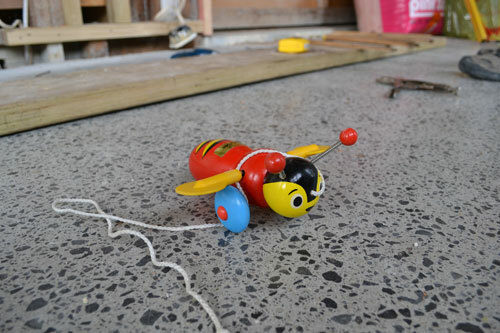 The whole reason we opted for concrete (other than husband’s keen interest in trying out some thermal mass) was that we’d never be able to match our existing floorboards and tiles just aren’t our thing (they do have their place though). So although we opted for a contrast I do like that there is some unity at least in the glossiness or lack thereof. 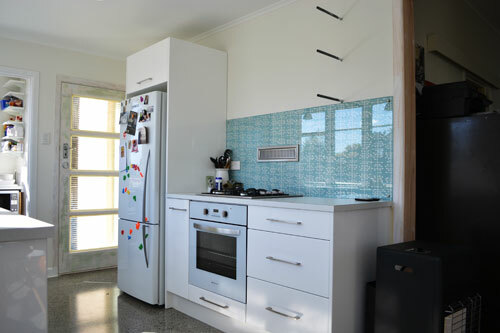 This entry was posted in DIY, Environmentally Friendly, Interiors, Kitchen, Our Renovation and tagged concrete, floor, kitchen, new zealand, renovating, thermal mass on May 26, 2011 by Jolene.